It is once again time to get out the paints and brushes, drawing pencils and cameras!! The time for the 2019 Director’s Creativity Showcase is upon us! Announcement of the annual art contest, including the guidelines, entry form, release form and other pertinent information is distributed. E-mail notifications from the Missouri Mental Health Foundation and DMH Central Office to DMH facilities and partner organizations. MMHF will also share this announcement on their Facebook and Twitter pages. Deadline for the submission of the artwork and forms. NOTE: Periodic reminders are distributed between October and January via e-mail and social media posts. Artwork submissions are judged by community volunteers. The artwork is judged the first part of March, while on display at the Missouri Department of Mental Health – Central Office in Jefferson City for a 2-day period. At this time, the artwork is also available for purchase (after judging is completed). 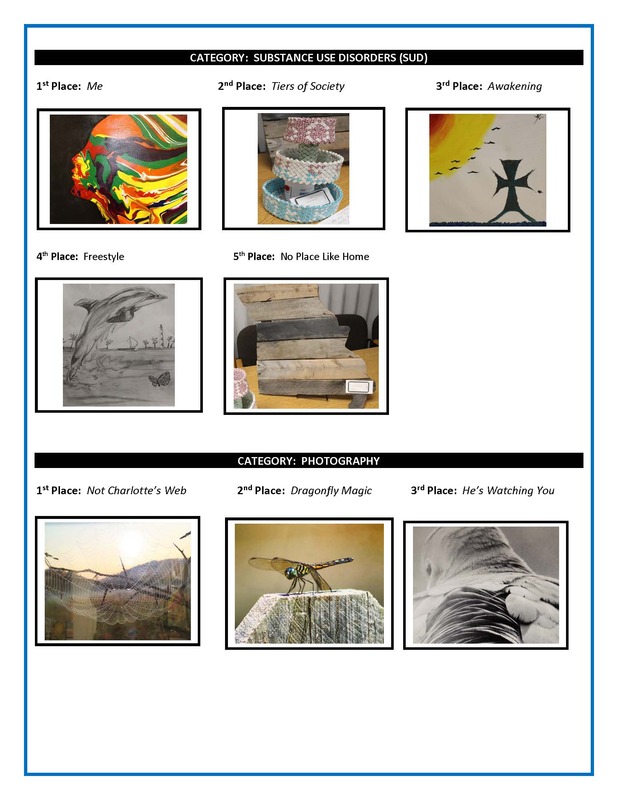 Artwork is selected for the annual Traveling Showcase. Making the artwork available for public viewing is one way we can help reduce stigma and raise awareness of issues impacting individuals and families living with mental illness, developmental disabilities and substance use disorders. 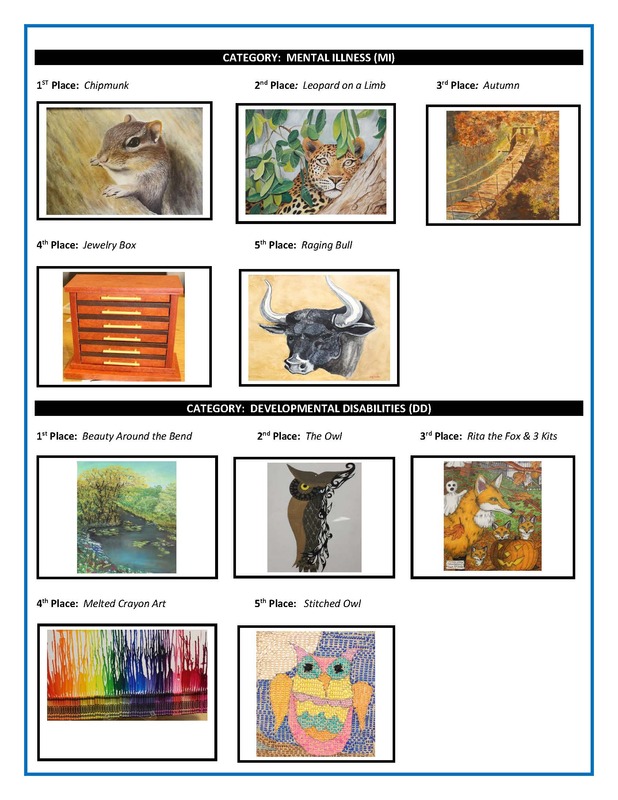 Notification to Artists: Traveling Showcase Artwork — letters are sent to the artists and facility contact persons notifying them their artwork was selected for the annual Traveling Showcase. The notification will state the artwork will be retained until January, after the last traveling show in December. In January, arrangements will be made to return the artwork to the artist. Arrangements are underway to return the artwork not included in the Traveling Show. Some of the artwork is returned via a mail delivery service, while larger and more delicate pieces are returned by DMH or facility/organization staff based on their travels to the general location of the artist. 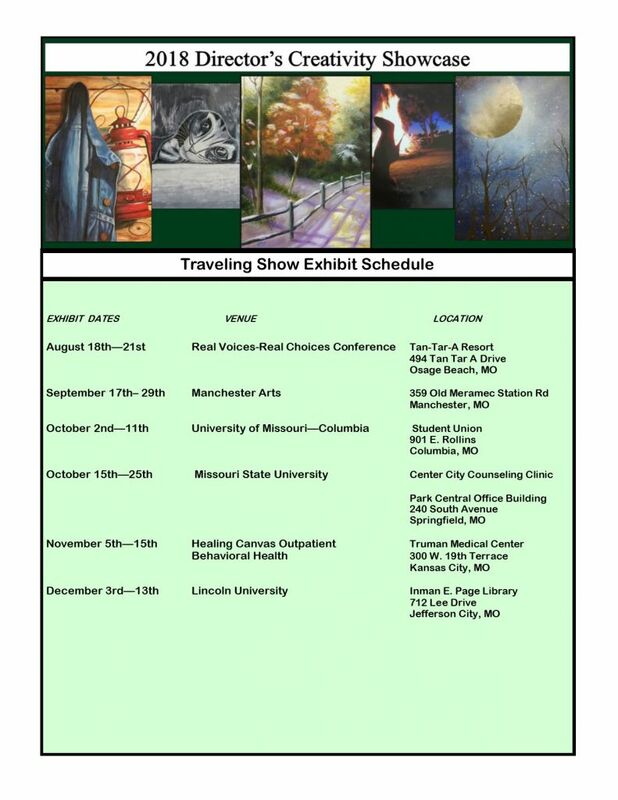 Traveling Show Artwork is displayed at multiple venues throughout Missouri. Arrangements are underway to return the artwork from the prior year’s Traveling Showcase. This event is sponsored by the Missouri Mental Health Foundation and the Missouri Department of Mental Health. 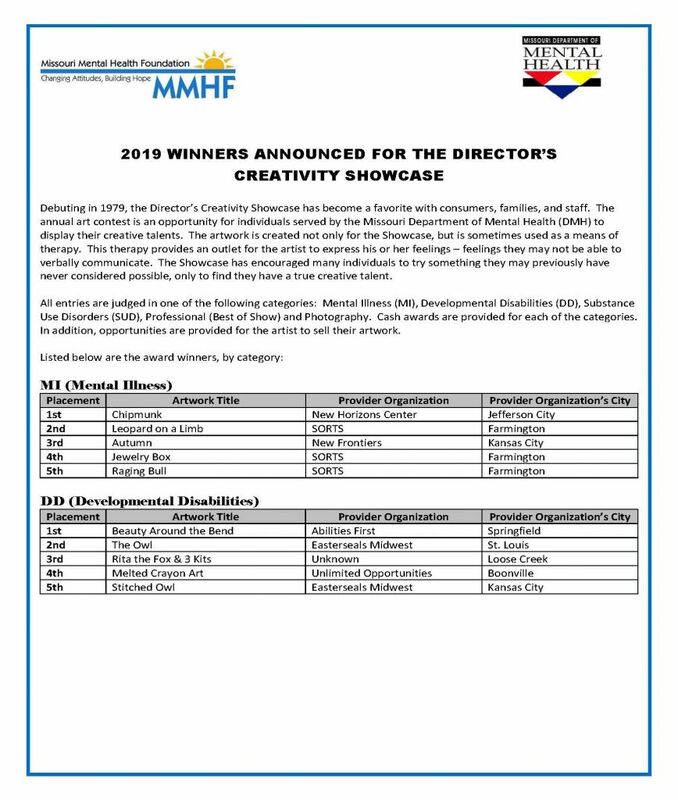 This competition is open to any individual receiving services through the Missouri Department of Mental Health provider network. When are artwork entries accepted? Entry forms must be completed and affixed to artwork as specified in the Guidelines, as well as a SIGNED release form submitted for every artist. Failure to submit a release form and/or completed entry form could exclude the artwork from being judged. Entry form must be completed and attached to the back of the artwork. Deadline for submission for entries is Friday, January 25, 2019 UNLESS you are delivering your entry to a facility for delivery to Jefferson City. If so, you must have your entry to that facility at least one week earlier (by January 18, 2019) so that it can be transported and delivered to Jefferson City by the deadline. A release form, signed by the artist/guardian, as well as a witness, MUST accompany all art, photos, and craft items submitted. Please do NOT attach the release form directly to the artwork. This form should be submitted separately, and will be retained by MMHF. 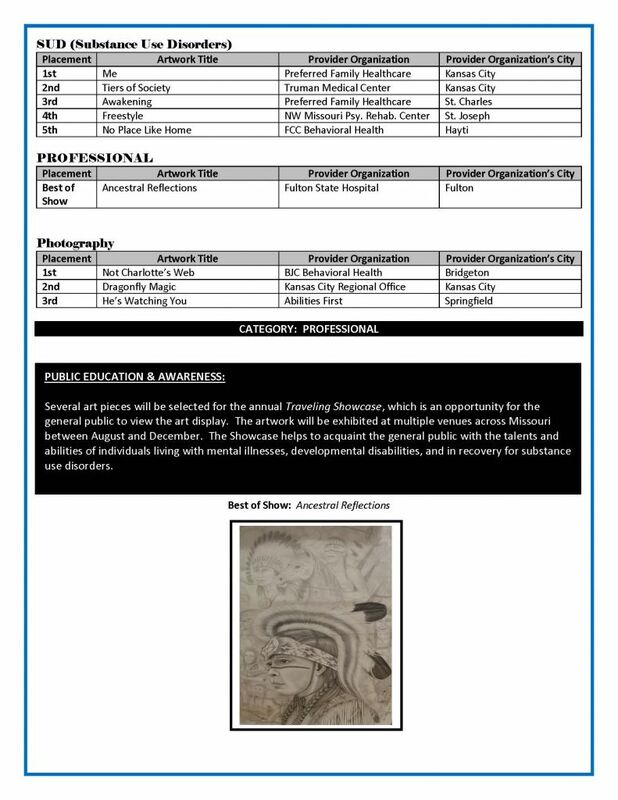 A signed release form allows the Missouri Mental Health Foundation and the Missouri Department of Mental Health to display the artwork, as well as use images of the art in its promotional materials.